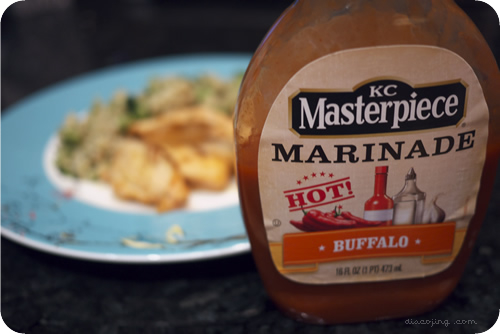 As part of the Foodbuzz Tastemaker Program, I received a bottle of KC Masterpiece® Buffalo Marinade recently. At first, I thought “Wow! Awesome, I can use this for some great things”, and then I thought, “Oh.. It’s a marinade… I need to marinade things…which will take time…and has to be meat”. So I tried that. I marinated some chicken breasts in the sauce for 30 minutes as was suggested and grilled them on a gas grill. while they were grilling, we brushed more sauce on the chicken and also brushed some on some white onion rings. 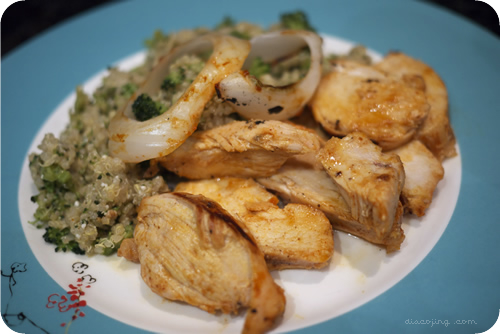 The chicken tasted alright, but I felt like the flavor wasn’t truly absorbed. The onions on the other hand, tasted great with the marinade. And that’s when I realized: I shouldn’t use this as a marinade, as intended, but rather a sauce or dressing! The photo above is of some shirataki (yam) noodles that I marinated in the sauce, then added some vegetables and cooked in a pan. I also used some below-average produce (crisper bin potatoes and frozen brussel sprouts) and they got a second lease on life with this sauce! 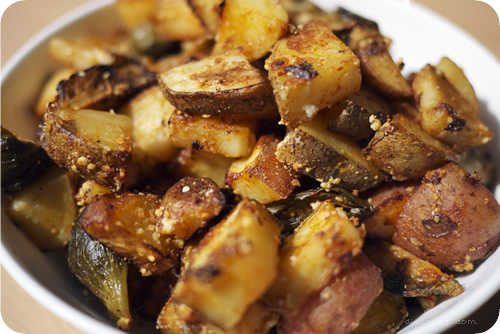 I tossed the cubed potatoes and sprout quarters in the sauce, added some pepper and cojita cheese, and roasted at 400 degrees for 40 minutes. 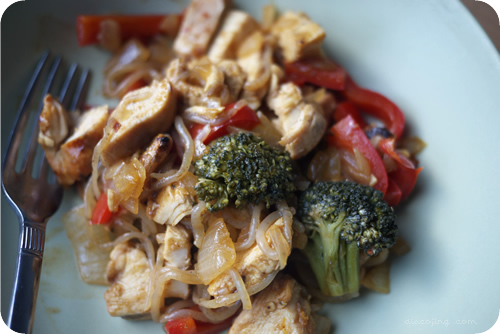 The vegetables had the perfect done-ness and spiciness. The only thing to mention is that with a marinade-method, most of the sauce is discarded, so the flavor isn’t as strong. When using this as a cooking sauce or “dressing”, the sauce stays put so the flavor is stronger. In the case of the buffalo sauce I received, the flavors are red pepper, garlic, paprika, vinegar, and…hot sauce. The heat tends to build up a bit if you don’t take a break with a beverage or side dish, but that might be my low heat tolerance talking. As part of the Foodbuzz Tastemaker Program, I received three squares of Ghirardelli Luxe Chocolates to sample — one each of milk, milk with almond, and milk with hazelnut. Ghirardelli touts that these chocolates blend the finest cocoa beans, whole milk, cocoa butter, and vanilla to “create a rich and creamy chocolate experience like no other”. I snapped the chocolate in half, rubbed the chocolate between my fingers, and smelled. The aroma was nutty and sweet on the hazelnut and almond flavors, but the milk smelled like regular milk chocolate. All the squares tasted creamy and there were no large sugar granules to be found like in lower-grade chocolates, but this difference may have been noticeable because 1) I was looking for it since it was advertised and 2) I used to work as a choclatier. These were great, indulgent snacks, but they weren’t much better than regular Hershey’s or Nestle chocolate, especially for the price difference.